For our United States readers, do not forget that a 1 ounce first class postage stamp price will increase to 39 cents on Sunday 2006-01-08. 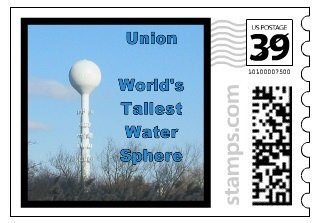 You can create your own World’s Tallest Water Sphere stamps at Stamps.com. Simply steal one of the beautiful World’s Tallest Water Sphere photos from this site, upload, pay, and you are in water sphere heaven. This entry was posted on Saturday, January 7th, 2006 at 9:13 am	and is filed under Fun Facts. You can follow any responses to this entry through the RSS 2.0 feed. Both comments and pings are currently closed.